I am an Indian passport holder travelling via Changi(Singapore) to AKL(Auckland Airport). Layover is for 13 hours. I want to travel outside the airport and see the city. What kind of visa do I need and how to obtain this? Transit travellers who satisfy the criteria for VFTF will have to meet the prevailing entry requirements before they are allowed entry into Singapore. Assessment for entry is determined by the Immigration & Checkpoints Authority (ICA) officers at the point of entry. Not the answer you're looking for? 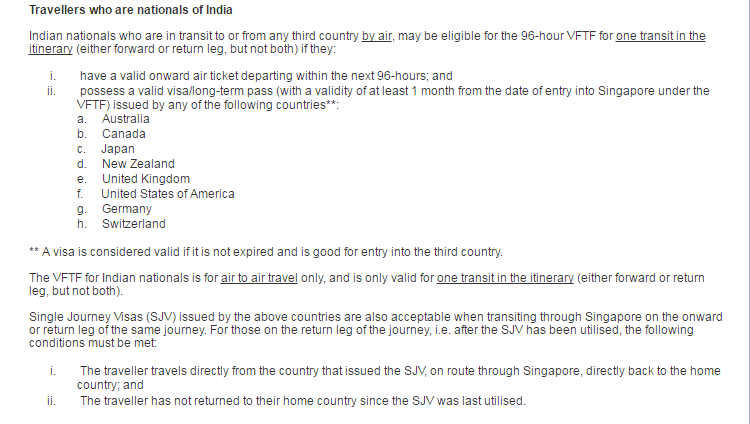 Browse other questions tagged visas indian-citizens transit-visas singapore or ask your own question.